Hot summer days cry out for Chocolate Strawberry Semifreddo. What’s a Semifreddo? It’s a partially frozen Italian dessert, usually in the form of an ice-cream cake, semi-frozen custards, and certain fruit tarts. I love the way that word slips off my tongue, so I’ve been saying semifreddo all day long, every chance I get. For my Strawberry Semifreddo, I ditched the ladyfingers that I normally use because my local grocery store didn’t have them and I didn’t want to drive 30 minutes to buy them (perils of small town living). While in the store I had a brilliant idea to use Milano double chocolate cookies instead. You’ll need about 2-1/2 packages of cookies. Hide the remaining 1/2 package for when you’re PMSing. This is a no-bake dessert that basically calls for layering, placing in the freezer to harden and repeating with another layer. It takes a little time, but it’s not hard to do at all. 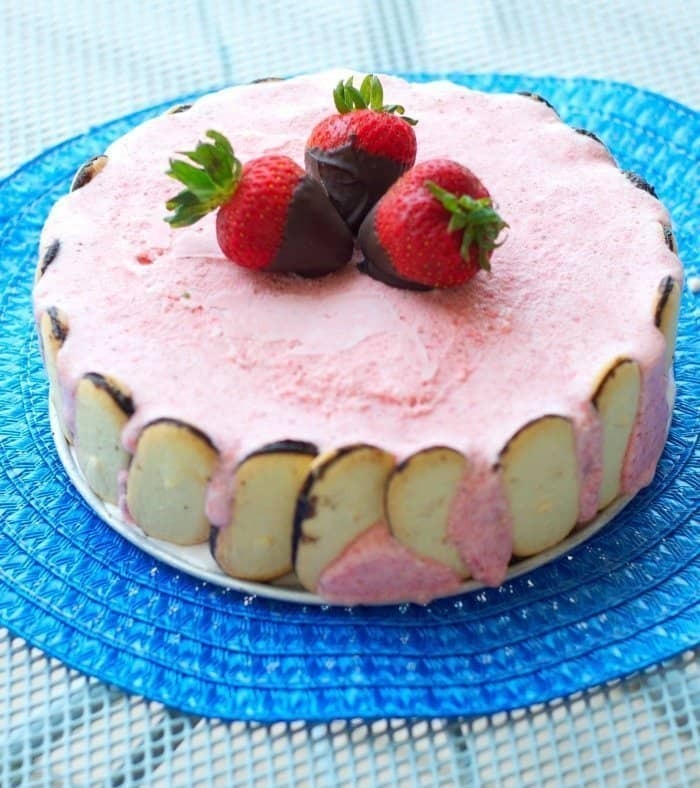 The bottom layer is strawberry ice cream and the top layer is made by combining marshmallow cream, pureed strawberries and whipped heavy cream. The thin ribbon of chocolate sandwiched between two crisp biscuits adds just the right touch of chocolate to this cool ice cream dessert. I melted a little semi-sweet chocolate and dipped strawberries as a garnish to make it prettier, but you don’t need them at all. If you’ve got guests coming for dinner, you’ll impress them for sure with this dessert (and you’ll get to say semifreddo again). You’ll also be your family’s favorite person if you jazz up a weekend OR weekday by whipping this out of the freezer. Don’t worry if the ice cream mixture oozes out between the Milano cookies. It just makes it look homemade and that’s a good thing. Helpful Hint: I usually put this together the night before I plan to serve it. Freeze it and forget it until dessert time. Line the bottom and sides of a springform pan with Milano cookies. Spread strawberry ice cream in pan and freeze for 30 minutes. Combine hulled strawberries and powdered sugar in a food processor and process until pureed. Reserve ¼ cup puree and whisk the rest with the marshmallow cream until well combined. 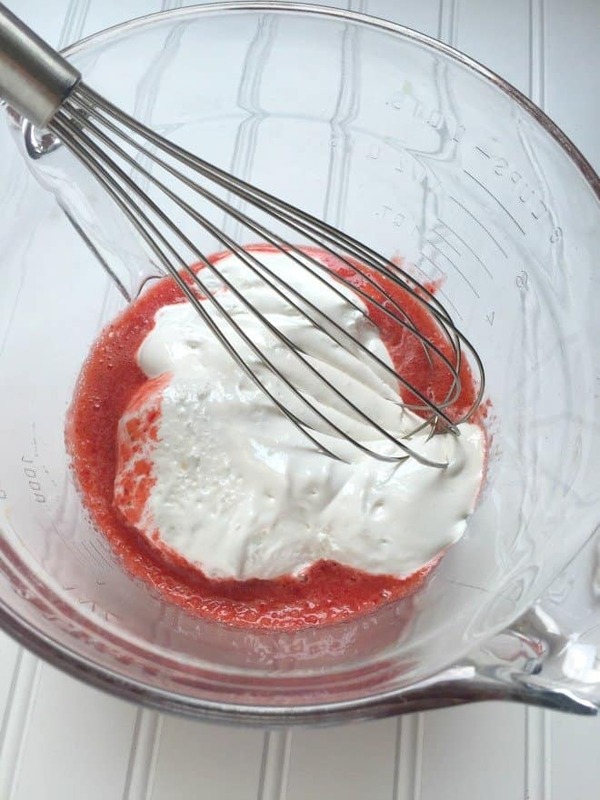 Beat cream at high speed with an electric mixer until stiff peaks form. Fold into marshmallow mixture. Pour over ice cream in pan. Drizzle reserved strawberry mixture over top, and gently swirl with a knife. 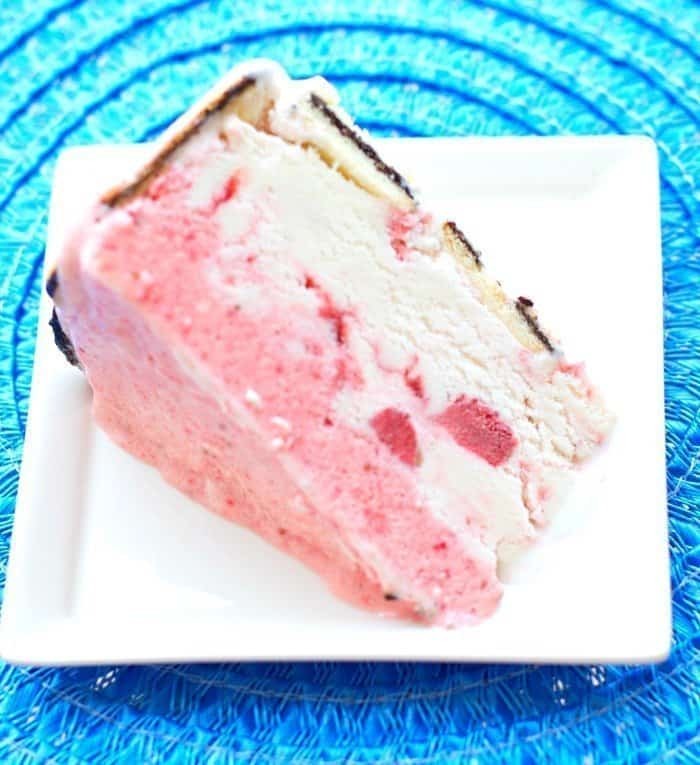 Let ice-cream cake stand at room temperature 5-10 minutes before serving. That looks wonderful! We’ve been on an ice cream eating spree lately. It’s been so hot here and this looks like something that will help keep us cool. Plus, I love that I don’t have to cook/bake anything. Oh my! This dessert looks delish! I know it woulds be hard to wait for this one! The photos are so bright and cherry. Pinning this! That looks AMAZING! 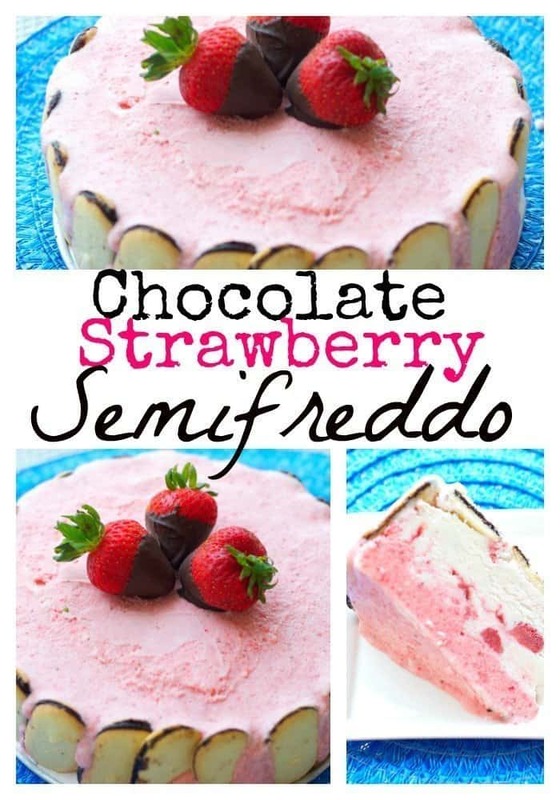 I am pretty sure I need to make this 🙂 And I love the word semifreddo…I’m going to impress people today. Wow! Brilliant use of Milanos! Genius really. I have never wanted to make a dessert more! Five stars! I love frozen treats, and one of my favorite cookies are mini Milanos. Thank you so much for sharing this. I can’t wait to make it! Stacie @ Divine Lifestyle recently posted…Blogger Bash is coming up in NYC July 16-17, 2015 | Buy Tickets Now! This looks like such a perfect summer dessert and I love how you used the Milano cookies as the crust ! I’ll be trying this one soon for sure! Wow, that looks amazing. It’s like nothing I’ve ever seen before. Looks so good, would love to try! I pinned this for later because I think it’s definitely a combination of ingredients that I would love to try out. Plus, I am a HUGE fan of Milanos. I think I would eat the ingredients before I got to assembly 😉 Thanks for the recipe, looks amazing! Wow that is a beautiful desert. You always have such great recipes. I appreciate them always! ‘t get enough this summer! This just makes my mouth water and crave for this. This looks really tasty and delicious. That looks so pretty and delicious. I could probably make this. My daughter’s birthday is coming up. It looks so delicious. I bet it would be perfect with a cup of coffee! This looks like such an amazing and delicious dessert. It looks so fluffy and scrumptious! I’ve never heard of a semifreddo before, but this looks like such a delicious recipe! I love chocolate and strawberry combined. You are making me drool lol. This looks absolutely a delicious treat. Hubby and son would definitley love this! Oooo now this looks absolutely delicious!!! Chocolate and strawberries and together?!?! Totally giving this a pin! 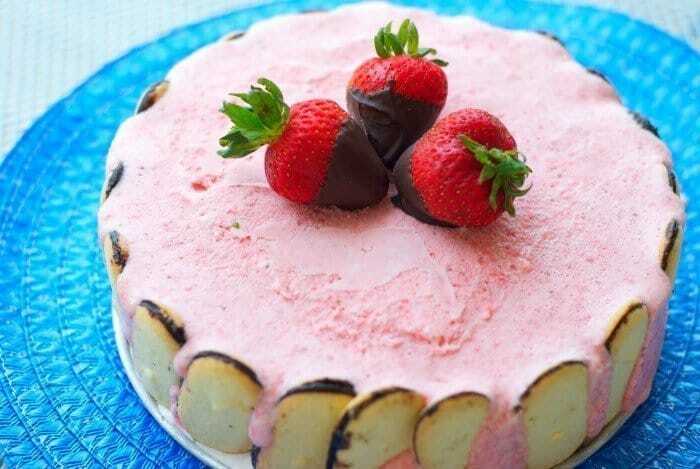 This Strawberry Semifreddo looks so delicious. I have never tried to make a Semifreddo before. I am going to try this on the weekend. Wow, that sure looks amazing. That’s dessert I would break my diet for. The milano cookies just make it even more delicious. YUMMY! I need to make this ASAP I would love to have this as a lunch time treat during the day. The fresh strawberries sound amazing since I love having crunchy strawberries in my ice cream. Oh goodness. I would love to try out this one – looks sooo good and seems yumm too! Semifreddo is a fun name to say! And it looks even more delicious. Anything with ice cream is a big hit in my house. This looks amazing!! My sweet tooth has been running on overdrive this week and I need to make this ASAP!! This looks so good. I love anything with strawberries! Hi There! Stopping in from Say G’day to check out your awesome recipe. I’d love for you to come share at Simple Supper Tuesday. Our party closes at 8pm EST on Sunday night. Alli, this looks AMAZING! I’m including this in my summer berry round up! !